This piece contains roeblingite, prehnite,xonotlite and andradite. 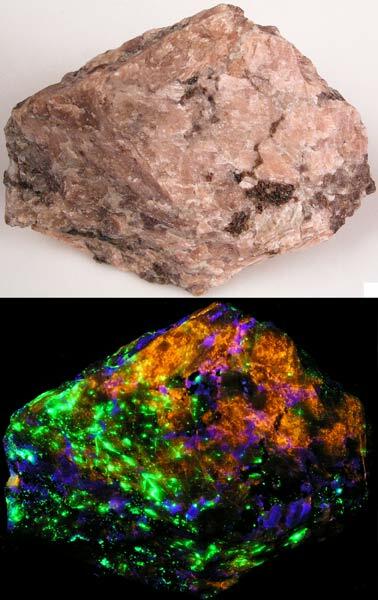 Under SW UV the roeblingite fluoresces red, the xonotlite fluoresces purple-blue and the prehnite fluoresces peach (and is actually on the other side of the stone). This rare piece comes from the Franklin mine, Sussex County, New Jersey. 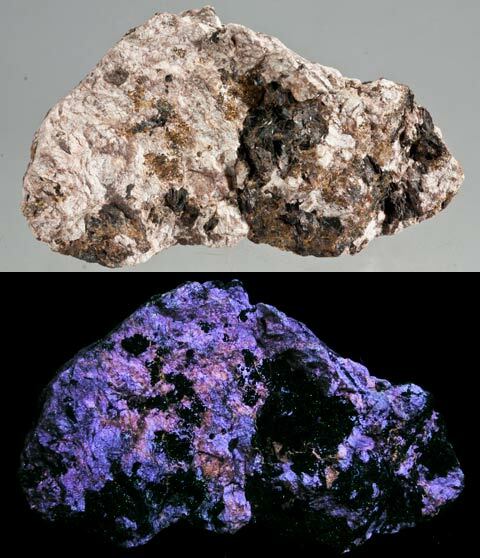 Roeblingite looks like plaster in daylight and can appear as a porcelain-like nodule. It weighs 6.3 oz. and is 3.0 x 2.8 x 1.0 inches. Prehnite with xonotlite from the Franklin mine, Franklin, NJ. Prehnite fluoresces peach SW and xonotlite fluoresces pale purple SW. It weighs 9.0 oz and is 3.8 x 2.0 x 1.8 inches Franklin prehnite with caryopilite. This prehnite glows an unusual mustard color SW.
Three pieces containing one of the most desirable fluorescent minerals from New Jersey. 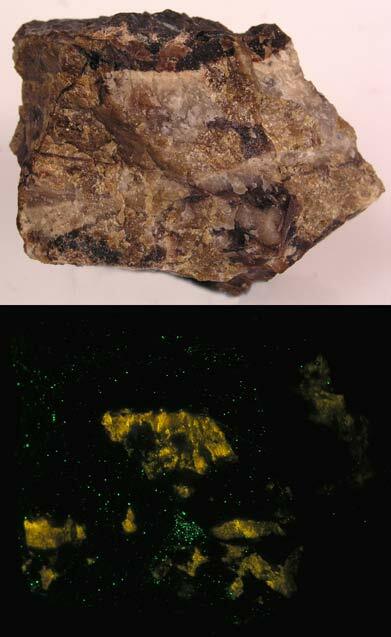 Margarosanite from the Franklin mine, Franklin, NJ. 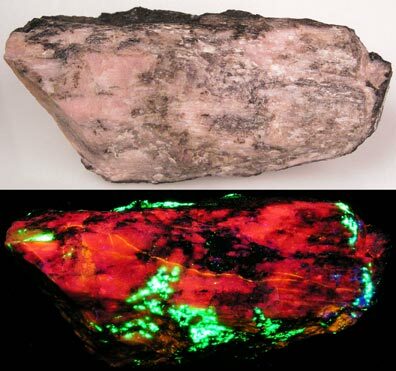 Margarosanite fluoresces sky blue or sometimes pink and blue SW, the calcite fluoresces orange-red SW, & the willemite fluoresces green SW. 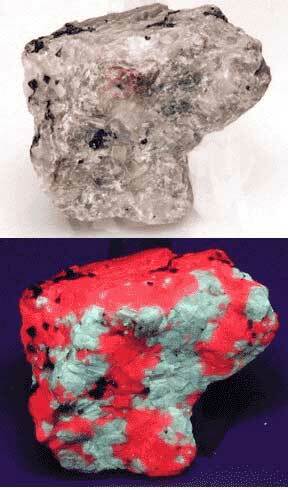 The piece on the right is unusual as it also has calcite, a rare combination. Margarosanite sells for about $115.00 an ounce in smaller pieces and more than doubles as the piece gets larger. A superb platy margarosanite with willemite from the Franklin mine, Franklin, Sussex County, NJ. It has shiny, platy crystals. 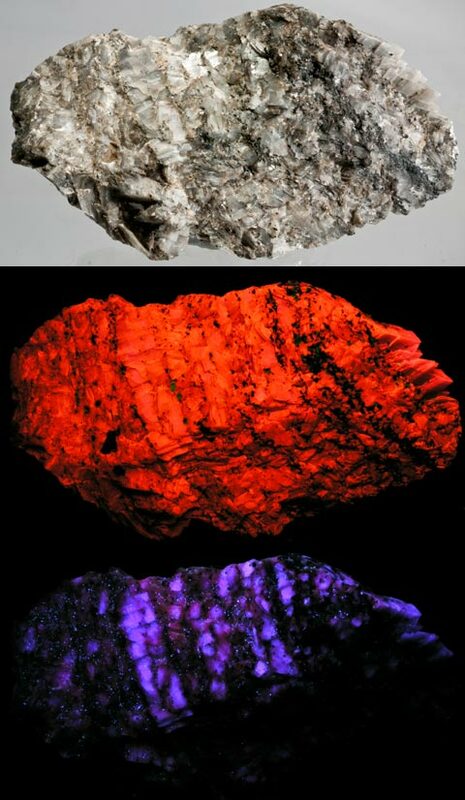 The margarosanite fluoresces sky blue and pink-red SW. The piece weighs 8.5 oz and is 2.5 x 2.0 x 1.8 inches. 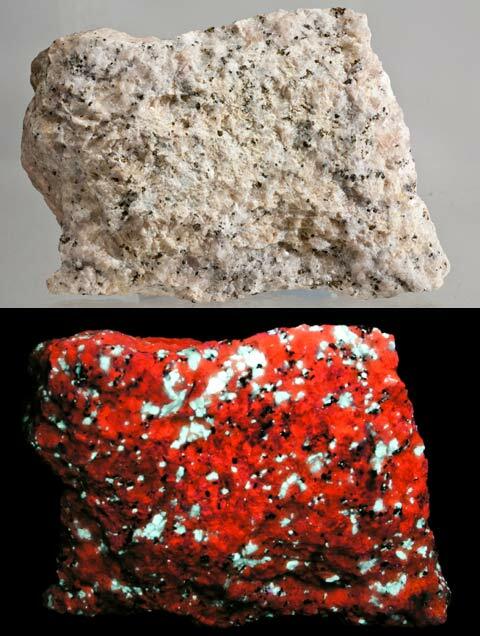 Barite (fluoresces white SW), calcite (fluoresces red-orange SW), and franklinite (black specks) from the Sterling Hill mine, Ogdensburg, NJ A beautiful Franklin barite on calcite. This is an incredible piece that weighs just under 4 pounds. 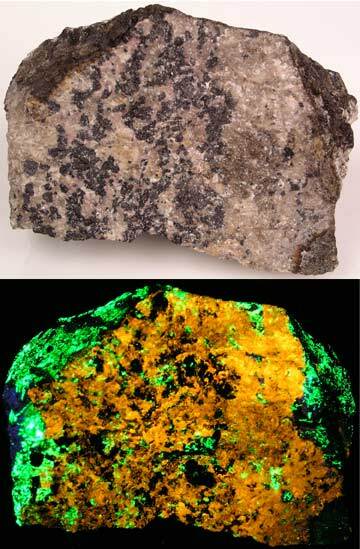 It is from the Franklin mine, Franklin, NJ. Usually Franklin barites are somewhat dirty looking. Below left is clinohedrite on hardystonite with grape-colored willemite from Franklin. 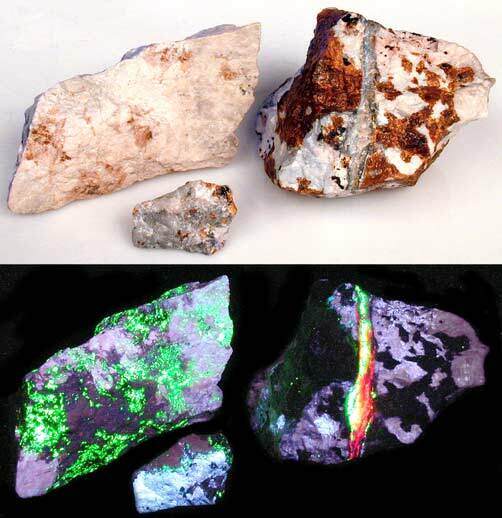 The clinohedrite fluoresces bright orange SW. Next to it is a superb piece of hardystonite (fluoresces purple-blue SW) and bustamite with clinohedrite (fluoresces orange SW) with touches of willemite. The clinohedrite is usually a surface coating. This piece seems to be seeped in clinohedrite. A very rare fluorescent bustamite from Franklin, NJ. 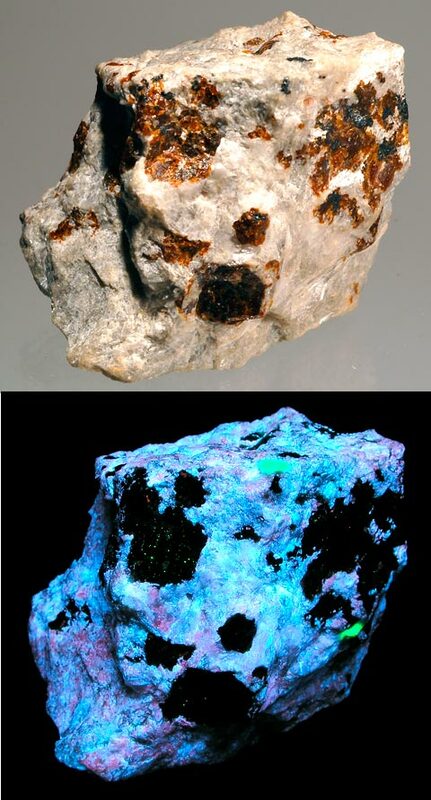 Most bustamite does not fluoresce. This one is especially bright red SW. You can also see some clinohedrite on the bottom with a few specks of hardystonite on the right side. 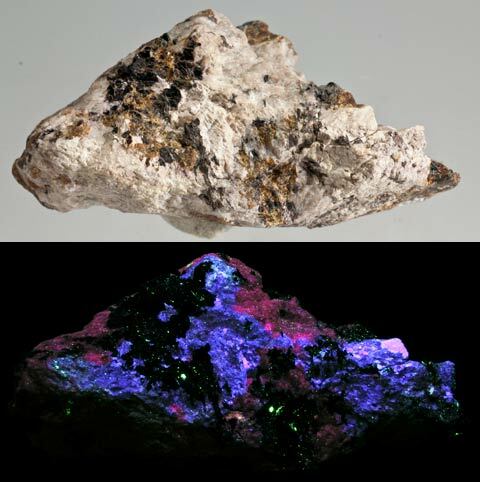 Franklin xonotlite (purple-blue-fluorescing) with hyalophane (fluoresces red) from the Franklin mine, Franklin, NJ. Shown under SW. Very rare xonotlite crystals on prehnite from Franklin, NJ. The xonotlite fluoresces pale purple SW and the prehnite fluoresces peach SW. This is a thumbnail sized piece. Books #3 on Flashlights, Picture Frames & Halley's Comet | Ghosts In The Cemetery| Waffle Recipes| Links Copyright 2002 through 2019 by Stuart Schneider. Do not use any parts of these pages without written permission.